Here we are 100 years later! We are very mindful at this time of the several bishops, many priests, religious brothers and sisters, deacons and dedicated lay people who have preceded us over the course of these 100 years. Soon after I returned from theAd Limina Apostolorum,the Diocese of Corpus Christi celebrated its 100th birthday. And guess who came to the celebration? Cardinals DiNardo and Dolan. It was a joy and a pleasure to have them with us. 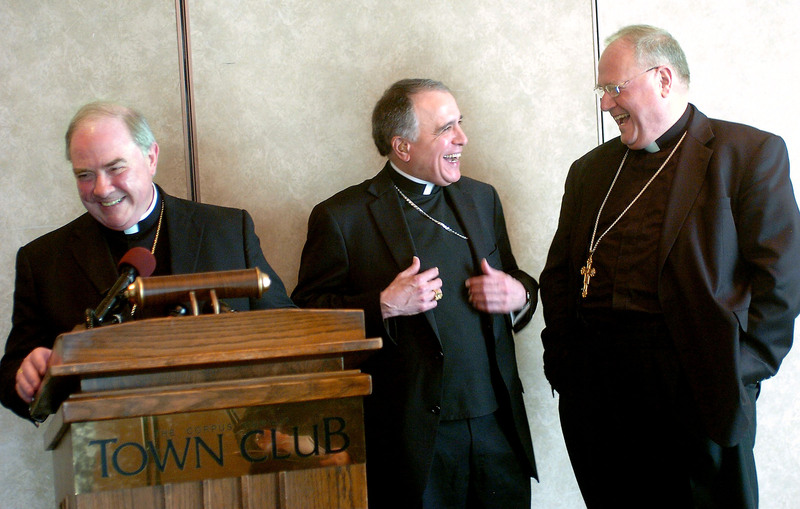 The Cardinals and me enjoying a good laugh during the press-conference that was held at the beginning of the day on 26 March 2012. 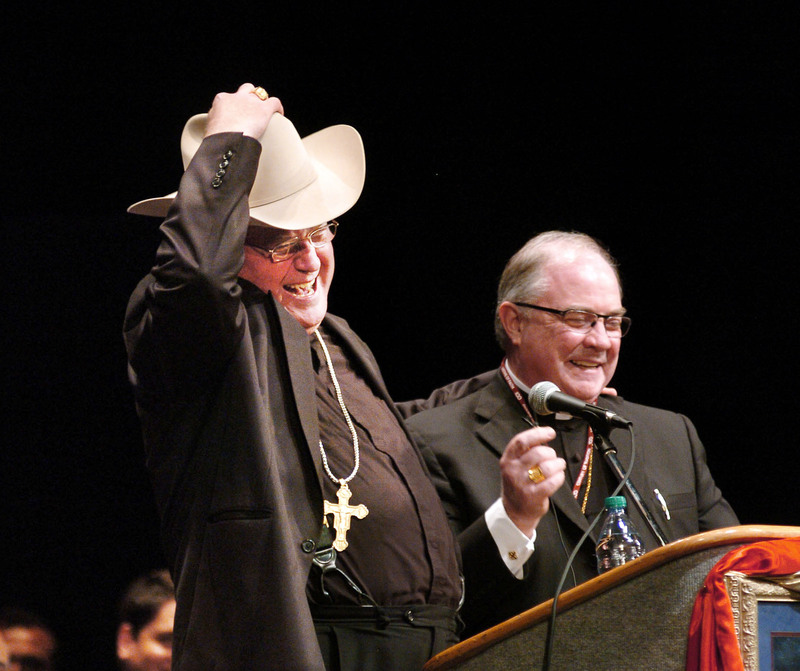 We even got Cardinal Dolan to sport a Stetson hat. More on the Mass & Formation Conference can be found at the Centennial Website. This website is jam-packed with our history and different events we have going on in the upcoming year. I hope you enjoy it. Having reviewed our history over the past months, we marvel at the zeal and the courage of so many pioneers of our diocese who have brought us to this point. We thank God for their faith and their dedication to Christ and the Church. As we head forward into the next 100 years, it is our turn. The circumstances have changed; the situation of our society is much different. However, our faith remains solid as we continue to bring Christ’s loving presence and His saving message to all. I pray that during the centennial year we will all be renewed in faith, hope and, above all, in charity. May our love for one another be recognized so that our brothers and sisters who are looking for “Living Water” will come closer to Christ and His Church. The New Evangelization is calling for this. The New Evangelization requires our witness of mutual love and our witness to the truth of the Gospel especially lived in our service to others by standing up for human dignity and life. As history is written over the next 100 years, may we be seen as women and men of faith and courage as was seen in our predecessors. May God bless you during this year. Let us live our faith with true dedication each day wherever we are.